Irish airports remained open today, but there is disruption in some parts of southern Europe. Transatlantic flights are being re-routed around the affected area, causing substantial delays. IAA expects airports to remain open until at least 4pm tomorrow. 21.44 Aer Lingus says it is expecting to operate a full service tomorrow. Ryanair says it is expecting its schedule to operate as normal, although there may be some early morning restrictions on services in and out of Milan and Porto. 20.07 Irish Aviation Authority says based on current information, Dublin, Shannon, Cork, Waterford, Kerry, and Galway airports will be open until 4pm tomorrow (Sunday). Donegal, Sligo, and Ireland West (Knock) airports will operate normally until 2pm when restrictions may apply. The position regarding restrictions will be confirmed at 9.30am tomorrow morning. Flights to and from North America and the northern Iberian Peninsula may continue to be at risk tomorrow, but passengers should check with their airline. 18.04 Stornoway on Lewis and Benbecula in the Outer Hebrides will be a no-fly zone from 7pm until midnight. 17.25 French fear that attendence at the Cannes film festival may be affected by the ash cloud, with many unable to fly in and out of the region. 17.23 Portugal's NAV air expects the ash cloud to move west and cover the Azores islands in the Atlantic from 6pm, closing airports and forcing a reduction in transatlantic traffic as flights in the direction Americas-Europe will be left without an alternative. 17.20 Portugal's NAV air authority said it expects the ash cloud to separate into two in the evening, with one part moving east over the Iberian peninsula, leaving Portuguese airspace clear from around midnight. 16.20 In France the national weather service said the ash cloud would be covering the southern part of the country later today. 16.18 An Air France test flight took off from Paris Charles de Gaulle airport to test ash levels. 16.15 Marseille airport, the main French hub for low-cost carrier Ryanair, said all that company's flights from 3pm had been cancelled. 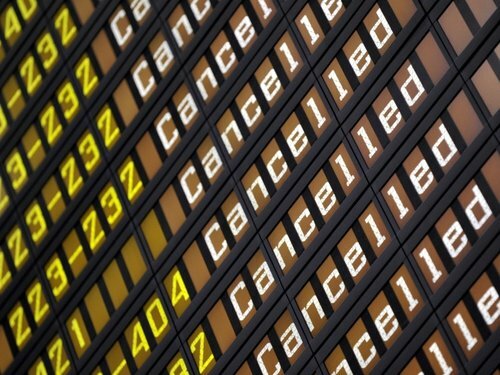 15.58 In Portugal 104 flights serving Lisbon, Oporto and Faro have been cancelled. Portuguese air traffic control said restrictions would be lifted gradually. 15.56 25,000 flights were expected to cross European skies today - well down from more than 30,000 yesterday. 15.24 Spanish Aviation authorities have closed Barcelona, Girona, Sabadell, Bilbao, San Sebastian, Vitoria, Zaragoza, Huesca, Pamplona, La Rioja, Santiago, A Coruña, Vigo, Asturias, Santander, León, Valladolid, Burgos and Salamanca airports until at least 9pm tonight. The Spanish government has said there was a chance the cloud could still be affecting Spain next week. The government said over 400 flights would be cancelled, leaving almost 40,000 people stuck in airports stretching from La Coruna in the northwest to Barcelona in the northeast. Spanish Transport Minister says extra places have been made available on long-distance trains and extra buses and boats were being laid on to help people reach their destinations. 14.28 Barcelona Airport to close at 2.30pm (Irish time). Currently there are no restrictions applying in Irish Airports and this is likely to continue until at least 6am local time on Sunday 9 May 2010. North Atlantic flights and flights to / from southern Europe are currently being impacted and this is likely to be the situation over the next 24 hours. When Irish airspace is open, the airlines - including Aer Lingus, Ryanair, Cityjet, Aer Arann, or any other operators - will decide whether their scheduled flights can go ahead. Passengers should always check their airline websites for up-to-date information. 13.00 All Scandinavian Airlines flights between Dublin and Oslo, Stockholm and Copenhagen are operating as normal today. 11.49 Flight EI136 Boston-Dublin is cancelled. Passengers will be re-accommodated on flight EI132 Boston-Dublin scheduled departure 19:15. 11.45 All BMI flights between Dublin and London Heathrow are operating as normal today. 11.40 There is uncertainty over the operation of flights from Ireland to the south of France. Customers holding confirmed reservations on flights to and from Nice are advised to check aerlingus.com for up to date information. 11.39 Aer Lingus has confirmed that it has been forced to cancel all flights from Dublin, Cork, Belfast and London Gatwick to Spain, Portugal and the Canary Islands for the remainder of the day with the exception of flights EI 782 from Dublin to Las Palmas and EI 783 from Las Palmas to Dublin. 11.15 The Spanish airport authority AENA said 15 northern airports have closed until at least 4pm due to high concentrations of ash. 11.10 The European air traffic agency Eurocontrol said airports were also closed or expected to close in northern Portugal and parts of southern France. 11.00 The French aviation authority said that based on current forecasts airports in southern France would remain open until noon on Monday. The French authority will give an update at 3pm. Atmospheric conditions have affected a small number of flights at Belfast International airport. An easyJet arrival from Faro in Portugal this morning was cancelled. Jet2.com, bmibaby Continental and Manx2.com serving Isle of Man are running as scheduled.